If you’re a Trump supporter and firmly believe he did not collude with, or is indebted in any way to Russia, then your best case scenario is that he’s madly in love with Vladimir Putin. It’s burning and it won’t go away. Donald Trump is doing Putin’s bidding. He’s argued for Russia to be readmitted to the G-7. He refuses to criticize Putin in regard to any matter. He congratulated him for winning a sham election. He refuses to answer if he’ll recognize Russia’s annexation of Crimea. He freaking gave Russians secrets in the Oval Office. On the first morning of the NATO Summit, Trump and his staff had a breakfast meeting with NATO Secretary General Jens Stoltenberg, where Trump badgered him about Germany purchasing gas from Russia, claiming they were captive and “controlled” by Russia. That brought back memories of his debate with Hillary Clinton, where he projected himself on her by saying she was Putin’s puppet. Secretary of State Mike Pompeo, NATO Ambassador Kay Bailey Hutchison, and Chief of Staff John Kelly all appeared uncomfortable sitting through Trump’s boorish tirade. Kelly appeared the most squirmish as he had difficulty sitting still. But, we found out later from the White House that his displeasure wasn’t with the president displaying his ignorance and bullying on an international stage, but with the fact that he didn’t get the Denny’s Grand Slam for breakfast. A statement from the White House, most likely concocted by Sarah Huckabee Sanders, said all he got was pastry and cheese. Why hasn’t someone in Europe figured out how to make a decent cheese yet? Fortunately for Kelly, their next stop is England, who are known for their exceptional cuisine. Trump doesn’t really care about Germany buying oil from Russia except that they’re not purchasing it from us. Trump was lying, as usual, about the extent of Germany’s dependence on Russian oil. Trump said, “They will be getting between 60 and 70 percent of their energy from Russia and a new pipeline.” The truth is, Germany isn’t that dependent on oil and only gets nine percent of their supply from Russia. If that’s being controlled, then the Canadians have us in a vice grip, who supply 15% of our oil. Another factor in this issue is that trade is an entirely unconnected issue from NATO. What, are we gangsters? Trump continued his tirade on how the majority of NATO members don’t spend 2% of their GDP on defense. He even said they need to up it to 4%, never mind the fact that we don’t spend that much of our GDP on defense. According to the World Bank, only nine nations in the world spend 4% or more on defense, and they’re all in Africa and the Middle East. Later, Trump said his bullying got the members to agree to raise their spending to 2%, which means Trump jumped into his time machine (it only goes backward) and went to 2010 when they made that agreement. Also, the agreement is that they’ll meet that goal by 2024, and in case you’re a Republican, it’s still 2018. Trump said NATO was stronger now than it was two days ago, just like our nuclear stockpile being larger now than before he went into office. Trump took personal credit for the purported spending increase, saying all the NATO allies congratulated him. “Everybody in the room thanked me.” France’s Emmanuel Macron shot that down. 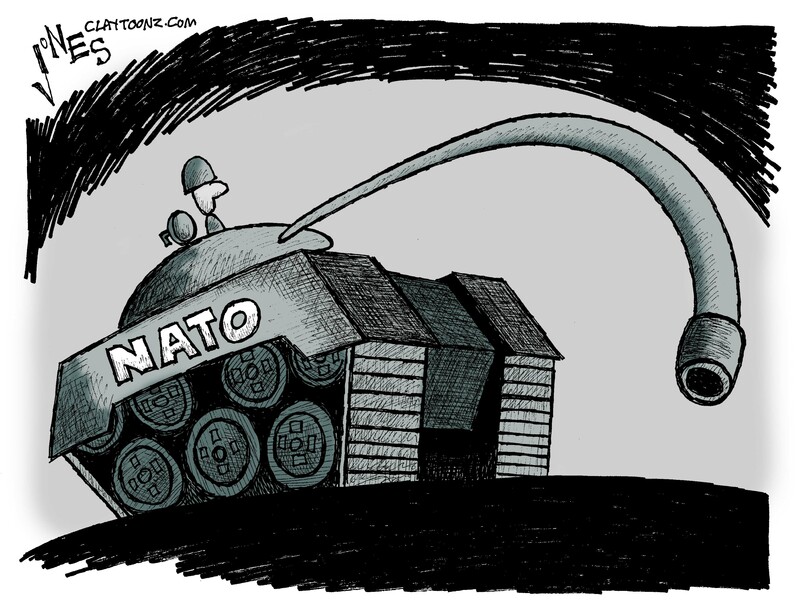 He pointed to a communique published Wednesday by NATO: “It confirms the goal of 2 percent by 2024. That’s all.” He also denied that Trump ever threatened to leave NATO. Trump argues that NATO gets more from us than we get from them, despite the fact the only time the alliance has gone into combat to protect an attacked member was after 9/11 when they joined the U.S. to fight in Afghanistan. Everyone knows Trump lies. But I’m sure people worldwide don’t pay attention to his dribble on a daily basis, where we in the States are subjected to it with every tweet, from the mundane to the serious, to the absurd. Now, with all of Europe watching the freakish carnival he brought to Brussels, our shame and embarrassment are fully documented for all to see. While Trump Baby is going to fly over London, mainland Europe got to see the real thing in the orange flesh. Trump doesn’t care about NATO. He doesn’t care about our alliances, the history, or the institutions we help build. He doesn’t care, as the leader of the free world, about being a champion for democratic institutions. His real agenda is to help Putin, and during his trip to Brussels, he was performing for two audiences; his rabid racist base and Putin. The highlight for Trump during his Eurotrip is his meeting with Putin, who must be enjoying watching his investment pay off. Even Russian state TV was commenting how Trump was accomplishing in two days the destabilization of NATO that they couldn’t do in 70 years. Discussing the meetings with European leaders beforehand, Trump said hanging out with Putin would be the easiest, and they even plan to be alone and off-the-record. What’s really infuriating about Trump’s obedience and preference for Putin is that he doesn’t even try to hide it. It’s doubtful Trump actually wants Europe to beef up their military, as that would be a forceful deterrent to Russia. Unless of course, Europe is dumb enough to spend themselves into dissolving their governments, like the USSR did. If our allies actually start spending more on defense, does that mean we, a nation with ten aircraft carriers and plans for a space force, will start spending less? I seriously doubt Trump has any influence on Europe spending more on their defense. He couldn’t even get John Kelly a croissan’wich.